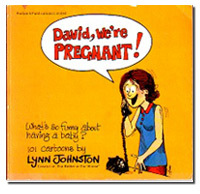 Summary: Lynn's first book of cartoons, this is a pre-FBorFW look at pregnancy and parenting. This book was originally released in 1978, and has been reprinted with a variety of covers over the years. It is currently out of print, and hard to find. 1975) Hi Mom! Hi Dad! Summary: This is Lynn's second book of pre-FBorFW cartoons, offering a glimpse into the funny side of being new parents. This book has been reprinted with various covers over the years, and is currently out of print. 1978) Do They Ever Grow Up? 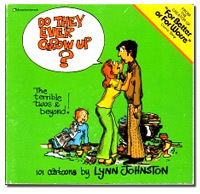 Summary: Lynn's third book of pre-FBorFW cartoons, this continues her series of books about the lighter side of parenting. This book has been reprinted with various covers over the years, and is currently out of print.